Savina is Bosa’s newest community. The building name was announced on January 19,2017. This new condo complex will include 285 residences, 533 parking spaces, and 11,550 sq. ft. of retail space. 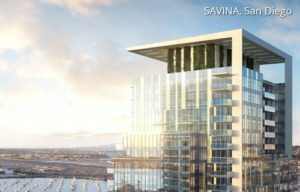 This building will be 36 stories, 415 ft feet tall, and will be located 2 blocks from the bay and will also be located next to Bosa’s Pacific Gate condo. We have arranged with Bosa for a sneak preview of the Pacific Gate floor plans, amenities and updates. Join our Mailing List below to hear the news First and receive VIP Access into our Exclusive Preview Party!